now it would be cool if I only used this desk for printing but that's not the case. I found solution in Mendel, the second generation reprap machine. Mendel is super cool reprap, it has small footprint, it requires less power... but all the extruder designs I seen for Mendel are not comparable to those of rapman's designed and sold by BFB. Getting your nozzle to 260C and extruding at high pressure will render PFTE tube based extruder tips unusable, and standard extruder drive has no way of applying enough pressure. dr. Bowyer recently published YAGE that IMHO had potential to push with enough strenght (I did modify the drive a bit and added some very sharp 2mm pitch pulley as drive instead of that M4 inset) but still, the PFTE tube design and 260C don't really go together, not to mention glued PFTE and high pressure so I looked at the hot end piece of rapman's extruder. BFB sells hot end kit for some reasonable price, and as I have few spare and I know this hot end can take a beating (the first one extruded kilograms of different filaments and is still in prime condition) I decided to give it a go. BFB hot end is "wide", it is ~80mm diameter so I had to change the x-carriage so it can fit. I heated the hot end to 270C and let it be hot for 2h before I checked if the x-carriage (made out of PLA) is getting soft - and, to mine surprise, it was not. I was afraid I will have to print the x-carriage using ABS or HDPE and that requires heated bed that I still don't have. Testing the extruder, it is bit slower then original bfb extruder (because bfb one is 1:1 and this one is 5:1 and because I'm using some second hand stepper of unknown manufacturer) but is pushing filament at more then 2-3mm/sec of filament (not the 0.5mm but the 3mm filament) per second and that's what I was aiming for. Well, not much these days*. But they do frequently throw tantrums, and some of those get close. So for those RepRappers who fell like sharing in a more "modern" context, we bring you the "RepRap Tantrums" Facebook group. This is a place where you can post pictures and videos of extruders engulfing themselves, particularly artistic birds' nests, or an absolutely spectacular huge printout - with an extruder driven through the middle of it. And now a seasonal warning for you to all check the batteries in your smoke alarms. Thanks. *Every software hack in the world wouldn't have stopped the first extruder fire I had, when an overheating TIP122 dribbled solder onto stripboard, permanently wiring the heater to 12V. Let's Go To The Faire! San Mateo County Event Center, California. 1) Folk showing off their machines! plastic filament, electronics, steppers and so on. 3) Folk who are still building machines! Swing by and introduce yourself in this forum thread! 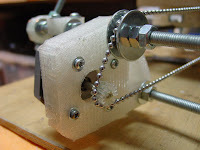 RepRap Geared Extruder from Adrian Bowyer on Vimeo. Be mounted somewhere at the side and drive a Bowden paste extruder, as outlined here. This is my first hack at a solution. This design was inspired by Wade's neat geared extruder that you can find here. I am Soon Wei from Singapore. Happen to see some of your messages. I just meet Xiang Hui few hours back. 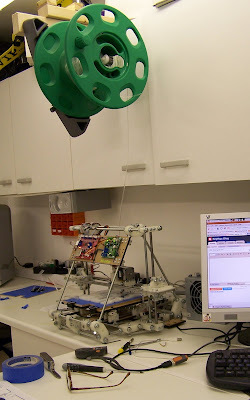 I would like to start a Singapore RepRap user group and start to build the First Singapore RepRap. (If we are?) FYI, I am an Elec Electronic Enginer and I've used a few Atmel MCU b4 so that is not a big issue. I should be able to source for the raw mech material except the RP connectors... I have access to a small lathe, but i forsee the 0.5mm on the barrier making is a challenge. Aha too excited and forgotten my goal. 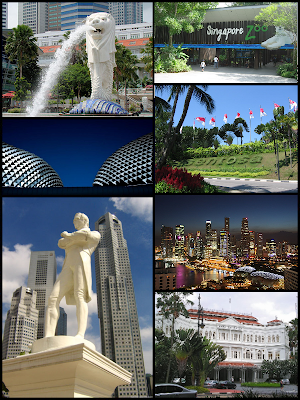 Would it be possible to start a RUS for Singapore? Thanks in advance. No problem. Good luck and happy RepRapping! So if you want to make a RepRap, do check them out. I have finally managed to print tiny little ball-chain gears that work with 3.3mm and 3.5mm diameter ball-chain and still fit on the NEMA17's 5mm output shaft. The trick is to print the gears in two pieces. As you can see in the photograph, I print two 4mm thick sections of gear and put them on the shaft with an M5 washer sandwiched in between. Make sure the teeth are lined up on both gears. This gives a channel to guide the ball-chain down the centre of the gear, and grips the sides of the balls adequately. As the gears age, it will also stop the balls grinding their way too far through the PLA, though I must admit that my experience with ball-chain Z axis gears suggests this will not be a major issue. As the gears are stuck on the shaft of the NEMA17, and the original Mendel Y Motor Bracket is thicker than the length of the NEMA17 drive shaft, a new motor bracket is needed. Also, the ball chain cannot take tight corners well, so a 608 bearing is mounted on the frame cross-member to act as a pulley. The same arrangement is fitted to the other side of the frame making the Y Idler Bracket obsolete. There are knock-on effects on the bed design and X Carriage which I'm still working around. As you may recall, the paste extruder I’ve been developing is based on the makerbot design which utilises air pressure to drive the paste from the nozzle. The reason for choosing this route was mainly that it allowed the extruder itself to be very compact, and thus make our lives easier when we get around to the head changer. However, as has been pointed out by various people, this does not offer the same control as say, a stepper motor driven extruder. Last week, Adrian had an awesome idea to get the best of both worlds….A Bowden paste extruder. I had a stab at making one yesterday. Basically, I used Araldite to set some PLA filament into the cavity of a bung, and used the standard approach of routing this filament through some PTFE tube to whatever drive mechanism we choose. Here I am testing it by hand, hopefully I’ll get around to driving it with a stepper motor soon, but it looks promising. For those of you unfamiliar with Google Summer of Code (GSoC) it is a paid Google position offered to ~1000 students world wide to work with a open source organization as developers. The students are given specific tasks and a summer to complete them during which time they regularly meet with their open source group and google in working on their development task. and will be linking the GSoC application to this page so go - get your idea on there!! We have just over 48 hours!!! Are you designing your own heated bed? Do you have a perfect one already? Please come check out the Heated Bed Forum Thread and the associated Heated Bed wiki page. Similarly, we're about to drop the McWire RepStrap like a slowly moving and generally unsatisfactory hot potato. And we want to hear what you are building instead as a bootstrap RepRap machine. By the way - we're nearly done with the server stuff to really open up the RepRap project to user contribution*, in part by actually making use of the mediawiki that we're moving into. 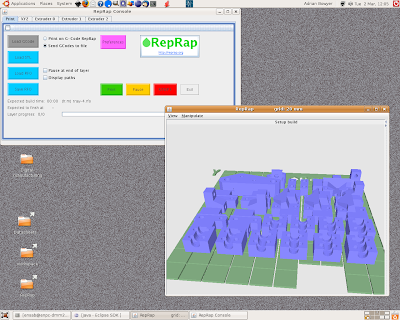 In the meantime, let me remind you that you're already very welcome to go to http://objects.reprap.org, poke around, log in and click "edit", or create a new page for your RepStrap, post-mendel RepRap, RepRap-related or RepRappable project. Or simply your version of the ideal heated bed, RepStrap, and so on. If you're not working on the Heated Bed or the RepStrap to beat all RepStraps, but you have a good project, try starting a new working group in the Forum, (and a new wiki page). Rhys is progressing on both the conducting paste and the deposited low-temperature alloy route to getting RepRap to print circuitry. So I have been working on a set of Mendel electronics that ought to be simple enough for the machine to reprap when we get the capability. 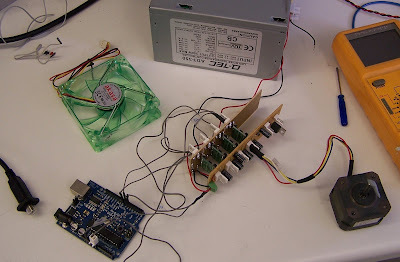 My prototype is shown above (between the Arduino and the stepper motor). It is so simple that, in fact, it's quite easy to put it together using just two pieces of stripboard, which may well be useful in itself. It is driven by an Arduino Mega (not the Diecimila that you can see I was using for testing in the picture), and has all the drivers needed for a complete Mendel with one extruder. Note that I have tested it on the bench, but not yet in an actual Mendel. As you can see, they are single sided, and have no thin tracks. This means that it should be possible to create the equivalent by comparatively crude methods. They should certainly be cuttable by a Dremel head mounted in a RepRap, for example. Now that the Java host software deals with RFO files (under Linux at least - see below), it is Pretty Simple* to run a machine in batch production mode making whole trays of parts. Following this one-off experiment, what I plan to do is this. The Mendels at Bath University will also shortly start churning out sets of parts too, and those will all go on Ebay when they become available with a buy-it-now price of £40. I want at-cost parts to be available right from the start, though I realise that they will be snapped up almost as soon as they go up for sale. At least everyone gets an equal chance. I won't pre-announce availability, so people will have to watch Ebay to get them. I think this is fairest. Unusually for a profit-making enterprise, though, we hereby encourage everyone else to auction their sets of reprapped Mendel parts too. As you will be able to see from the Ebay link above, there is some dosh to be made. Let's all spread RepRap and all make some money doing it. I put the post-tensioned beam system through its paces. It works well for a first cut design but obviously it can benefit for more work. A month ago, I designed a light frame structure which I could post tension and use to replace much of the steel in a next generation Reprap printer. I think it's pretty obvious where this is going. Full multi-material handling, including using different materials for outline, infill and overhang-support. This anticipates the Mendel multiple head/head changer that we're working on. It also allows you to use a single material in three different patterns for those three functions. Full RFO File support. This allows you to load lots of items to be printed, move them about where you want, and then save the setup for future use. You can also load multiple copies of a single object with one click. Pre-defined RFO files for a complete Mendel. These allow you to print a copy of a Mendel with minimum fuss. Checksums in communication. The G Codes sent from the host computer to the RepRap machine down the USB now have a checksum added, and the firmware can request a resend in the case of an error. Layer counting on builds. The software embeds layer numbers as comments in the G Code files it generates, then uses these to report build progress. The documentation for the new host software is here. Coming soon: build to layer N; pause at the end of the current layer; start build at layer N, so you can stop a build in the middle, then resume it later. 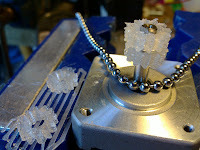 RepRap Mendel making Mendels from Adrian Bowyer on Vimeo. about your motives and efforts to use and to develop RepRap, or any derivative machine (for example, MakerBot). The survey is being done under the auspices of MIT and Tilburg University. It doesn't take long to fill out, and it would be a big help - not just to Erik, but to all of us - if you could do so. So I encourage you all please to take a few minutes to click the boxes.